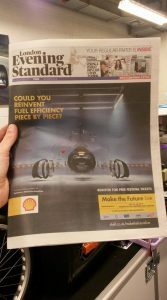 You will very likely have have seen images of UCL Racing’s sleek monocoque hydrogen-powered vehicle on billboards and electronic displays around the city, on the cover of the Evening Standard, Metro and Time Out and even on the television news. 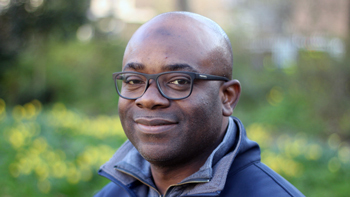 The undergraduate group design project, lead by Senior Teaching Fellow Dr Tim Baker, also took to the streets around Queen Elizabeth Olympic Park in Stratford, as a part of the Shell Eco Marathon 2017. 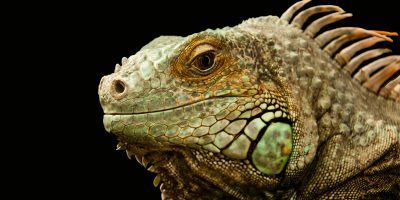 4th year MEng graduand Jason Biddlecombe, part of our Shell Eco-marathon Team, gives us his inside view of the drama at QEOP. 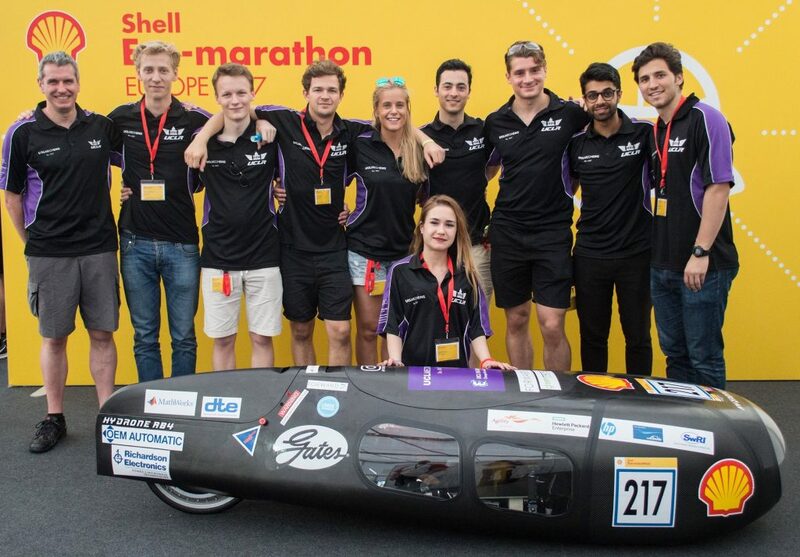 Our team had to arrive at the Shell Eco-Marathon by 6pm on Tuesday, so naturally we worked through the night on Monday, early Tuesday morning and arrived just in time at Stratford. 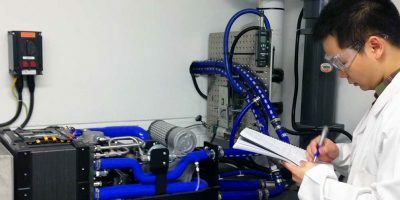 O n Wednesday we raced through technical inspection passing 7/11 stages, however we were required to ensure flowmeter visibility and install a pressure gauge in order to pass the hydrogen energy verification stage. It took all of Thursday to pass the remaining more in depth safety stages, but by the evening we were ready to race. Most of Friday morning was spent perfecting every last detail before running the car in our afternoon prototype slot, however, nothing can prepare you for the last minute rush before getting on track. In the haste of it all, we started the 10 laps with very little hydrogen in our tank as we had been testing our fuel cell all morning. We did not make it up the hill on the first lap as a result! Fortunately it was not the power system that was incapable of making it up the hill, and on Saturday morning we set off for another run and made it up the hill, only to take a fast corner on two wheels causing our motor mount to separate from the monocoque! With no drive coming from the throttle we stopped halfway around the second lap. After assessing the (thankfully) minimal damage, a quick fix of replacing adhesive with bolts enabled us to try again in the afternoon. This time everything went swimmingly, but on the 4th lap we were mistakenly pulled off by the organisers who thought the driver’s visor was up! They did not count this run and so we still had 2/4 left, however it was too late in the day – leaving Sunday to set our fuel efficiency. Sunday morning was crucial. 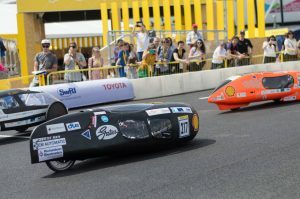 Only 2 out of the 14 hydrogen prototype teams had managed to set times, both with efficiencies of around 500-700 km/m^3. Using data from the first two attempts, our predicted efficiencies were in the 300-400 km/m^3 range, and the possibility of making the podium was in our sights. The morning run was going well and we were hitting the ideal times and velocities around the track. At the 7th lap however, the windows began to steam up, drastically reducing driver vision. As a result we were pulled off the track after the 8th lap for not sounding our horn when overtaking. Quick fixes of anti-fog spray, added air holes and vents in the windows meant we were ready to race again at lunchtime. 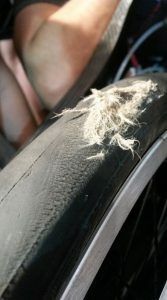 We made 7 perfect laps only to get a rear puncture from car debris on the track, bringing us to a standstill on the 8th. 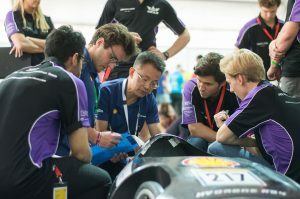 The experience was invaluable and having completed 24 laps, we believe we have set a strong status for UCL Racing at the Shell Eco-Marathon, despite not making an official efficiency score. Until next year!